Plan (or improvise) your dramatic exit through the streets of Dunwall. One of the best perks of being a supernatural assassin is that you're never at a loss for options. At least, that's what the latest trailer for Arkane Studios' Dishonored would have you believe. Sneaking up on a target in a shady alleyway is easy enough, but the getaway is where the fun starts. When there's nowhere to hide and the guards are almost upon you, how do you escape with most of your blood still inside your body? The trailer shows off three different playstyles, each of them starting with the freshly murdered target and ending with Corvo slipping away into a nearby river. 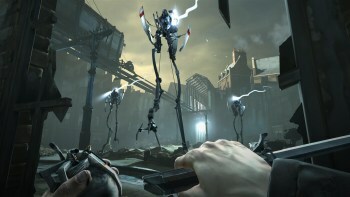 In the first method, "The Long Jump", the player makes full use of Corvo's acrobatic abilities, relying heavily on the Blink power and some nimble climbing. "Sleep Tight" takes a slightly more confrontational approach, bringing more of Corvo's arsenal into the fight as he tranquilizes the attacking guards with a few well-placed darts. Finally, "Chain Possession" abuses the Possession power to jump between the bodies of hapless guards (including one of the intimidating walker-mounted Tall Boys) before diving into the river undetected. Between this video and the gameplay walkthroughs from E3, it certainly looks like Dishonored is serious about making sure the player always has interesting choices to make. You'll be able to choose your strategy for yourself when the game hits shelves on October 9, but in the meantime, keep an eye out for new videos - the trailer hints that a "Creative Kills" video is coming soon.